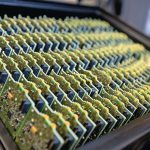 “We were able to reduce the time spent on material storage and picking by 30 percent,” says Michel Wucher, head of SMT production operations at Vega. 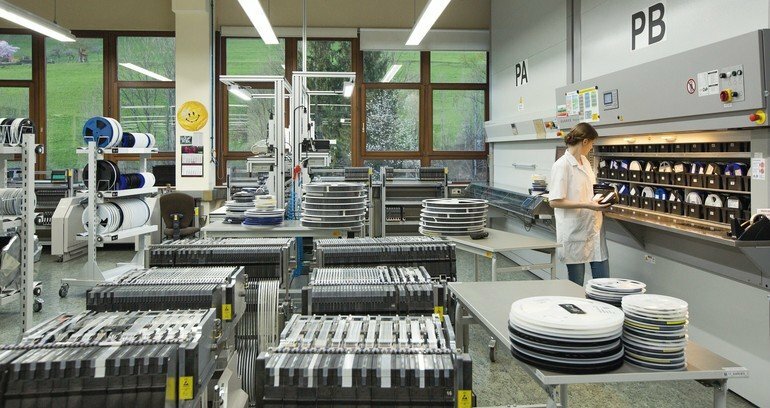 Each year, the company ships over 400,000 sensor solutions from Schiltach in the Black Forest to customers all over the world. Vega, a member of the SMT Smart Network, produces all electronics for its measurement devices in-house on three SMT lines with ASM solutions. To simplify these processes, the company agreed with its component suppliers on a special barcode labelling system. When component reels arrive, they are recorded with a MODI scanner, and a unique ID is assigned. Vega Grieshaber KG develops and manufactures sensors for measuring fill levels, point levels and pressure, as well as devices and software for integrating these measurements into process control systems. The company produces all electronics for its measurement devices in-house on three SMT lines with ASM solutions. 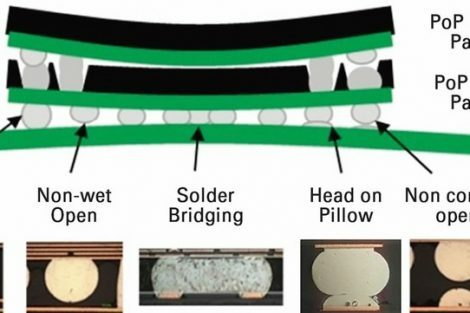 To streamline the entire process, both companies recently completed a project to optimize the material flow. Each year, the sensor manufacturer ships over 400,000 sensor solutions from Schiltach in the Black Forest to customers all over the world. For almost 60 years, the family-owned company has developed and manufactured products for demanding measurement tasks in chemical and pharmaceutical plants, in the food industry, in water supply and treatment systems, in landfills, in mining and energy production, on drilling platforms, and on ships and airplanes. 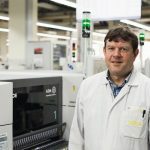 They produce modular electronics, which are a central component of each sensor system, in two shifts on three SMT lines with Siplace placement machines and DEK printers. 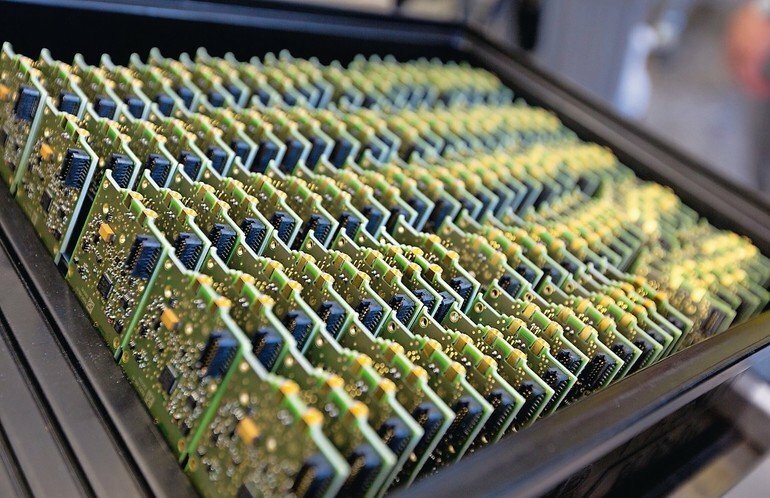 Between 150,000 and 200,000 modules on 85,000 to 90,000 PCBs leave the lines each month. In 2017, the company placed more than 164 million components, with significant increases expected for 2018. The spectrum comprises 0402 shapes in 0.5 mm grids, BGAs in grids of up to 0.4 mm, and PiPs. For quality and efficiency reasons, the company aims to automate its production wherever possible. 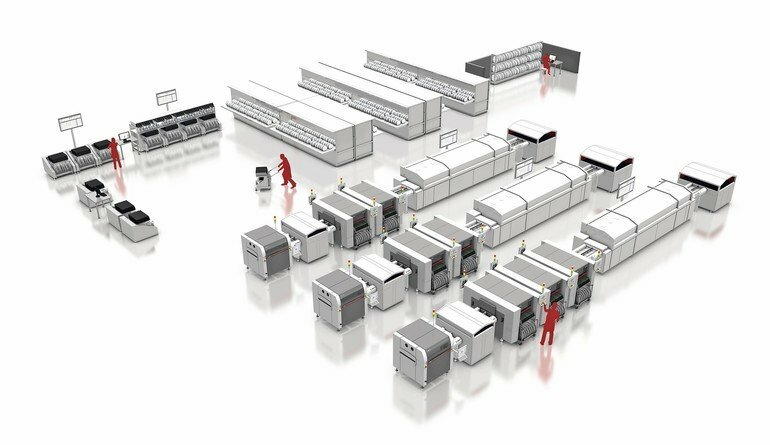 In its SMT operation, a single person per shift handles the setups while another one supports the printers, dispensers, placement machines, reflow oven, AOI, and the handling equipment. There is also a shift leader and a technician for multiple shifts. The company is a member of the SMT Smart Network, a cooperative network that ASM‘s experts have founded for large and small companies with different production models all over the world. Its goal is to develop and optimize smart workflows in the individual member companies. The resulting findings and best practices will then be shared within the SMT Smart Network. At Vega, the experts focused on integrating and transparently controlling the company‘s material flows with the Siplace Material Manager. As a result, the need for manual assists was significantly reduced, and most material-related stops were eliminated. To simplify these processes, the company agreed with its component suppliers on a special barcode labelling system. When component reels arrive, they are recorded with a MODI scanner, and a unique ID is assigned. Scanning this ID during all material movements ensures total transparency, because the location of each reel is known at all times. After their initial scan, the components are taken to the SMT plant and stored. The company has roughly 90 million components in stock on 25,000 reels with approximately 1,500 different article numbers. 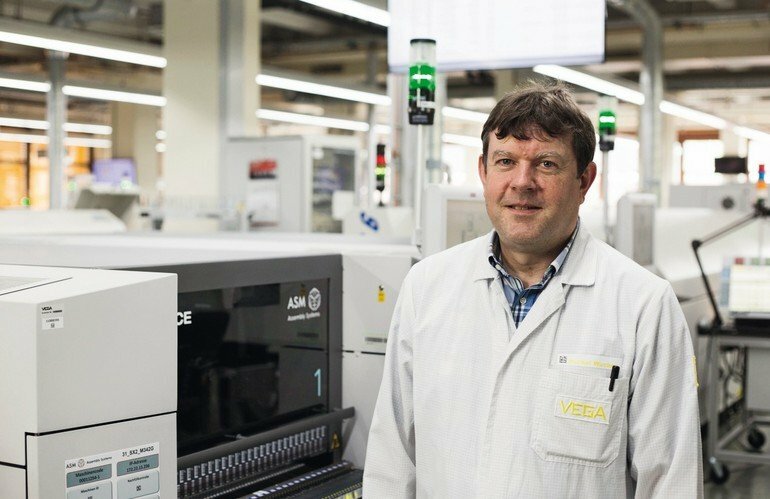 “Whether you are talking about an automatic Kardex storage system, MSD cabinets, the setup preparation area, or the actual production machines – all of them are covered and managed by the ASM Material Manager,” explains Michel Wucher, who heads the SMT production operations at Vega. The company operates with setup families. When the operator in the setup area selects the setup on his PDA, the Material Manager generates a BOM or pick list automatically and marks the items as reserved to prevent them from being scheduled for another production job. Without the need for printouts, PDAs guide employees to the various storage bins in the most efficient manner. The Kardex system issues the reels directly based on the Material Manager’s commands, and the operator confirms the receipt of each reel by scanning its barcode. When all items have been issued, the operator begins setting up the feeders on the single-slot EDIF. Afterwards, the feeders are inserted into the proper slots on the changeover table. Next, previously kitted feeders from the active feeder pool are added to the setup. The active feeder pool functions as a waiting room for feeders, because this is where kitted feeders sit and wait for one of the upcoming setups. Placing them in the active feeders avoids unnecessary tear-downs and cuts back on material travel. 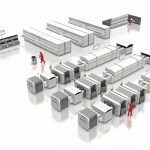 What makes all this possible is the integrated material flow control of the Material Manager which covers all storage locations and material-related processes. In the setup preparation area, the ASM Material Setup Assistant guides operators step-by-step through the preparation process with the help of the feeder LEDs. Once all newly set-up feeders and those from the active feeder pool are in their proper locations, the ASM Setup Center software verifies the setup, and the finalized changeover tables, after a final setup control with Siplace Setup Center, are rolled to their respective machines. “Our Siplace placement solutions record all material movement and consumption details during the production and report the information to the Material Manager,” says Michel Wucher about another benefit of the smart workflow. The ASM Line Monitor creates an additional level of transparency, because it displays on large monitors above the lines which feeders are about to run empty. And thanks to the smart material logistics system, fresh supplies have already been moved to the respective lines. This enables operators to splice reels before a line stop occurs. 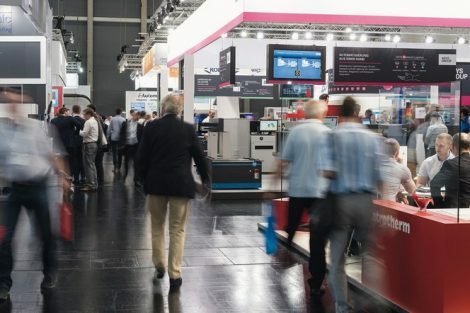 “The multi-line integration of smart material flow solutions such as the ASM’s Material Manager, Material Setup Assistant, Kardex automatic storage systems and Modi have paid off for us,” reports Michel Wucher. Concrete improvements include space savings of over 30 % in material logistics and setup preparation, and 30 % faster warehousing and retrieval procedures. All-in-all, optimizing the workflow via software has cut the time requirements for setup preparation operations in half – a significant gain in efficiency and flexibility for the sensor manufacturer. An open and global network of reference factories with the singular goal of promoting best practice sharing for electronics manufacturers on the road to the Smart Factory: this is the idea behind the SMT Smart Network. Its members, ten manufacturers from Germany to the USA, China, India, the Netherlands and Sweden, all were involved in trailblazing projects to improve the workflows of their respective companies’ together with SMT solutions provider ASM. The same approached them with the idea to interconnect via its SMT Centers of Competence: “Each factory must determine its own path to the Smart SMT Factory, but everyone can benefit from experiences and best practices in other companies – that‘s the idea being shared by all members of the SMT Smart Network,” explains Alexander Hagenfeldt, Project Manager SMT Smart Factory. 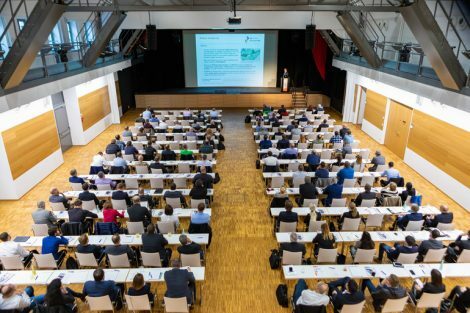 In November 2017, the productronica trade fair provided an ideal opportunity for members of the SMT Smart Network to get together to exchange experiences and plan new projects. In the meantime, the companies have begun visiting each other: BYD and ATH from China were joined by Alessandro Bonara, head of the company’s AS’s own SMT production, in December at the two respective production sites. The plans for the future of the SMT Smart Network are clear: to increase exchange, to learn from each other, and to grow. “With ASM‘s organizational support, the SMT Smart Network allows us to go in new and innovative directions that lead to clear improvements in users’ KPIs. The network is open to anyone who wants to make their electronics production smarter, share their experiences, and subject themselves to open benchmarking. The only requirements: be willing to make intelligent and long-term process improvements and share your experiences with other members. Even after only a few months and meetings, it is already becoming abundantly clear that everyone benefits from this type of cooperation. I am confident that this network will enable us to reach our goals with much more speed and certainty,” said Jochem Winkelman, General Manager of Dutch SMT Smart Network member, Rena. Ein Hersteller von Füllstands- und Druckmesstechnik für die Prozessindustrie produziert sämtliche Elektronik für die Messgeräte im eigenen Haus auf drei SMT-Linien mit ASM-Lösungen. Der Artikel zeigt auf, wie durch die enge Zusammenarbeit beider Unternehmen der komplette Prozess durch einen optimierten Materialfluss erheblich verbessert werden konnte. Un fabricant de technologie de mesure de niveau et de pression pour l‘industrie des procédés, produit en interne toute l‘électronique pour les appareils de mesure, sur trois lignes CMS avec les solutions d’ASM. L‘article d‘écrit comment la coopération entre les deux entreprises a considérablement amélioré l‘ensemble du processus, grâce à un flux de matériaux optimisé. Производитель оборудования для измерения уровня и давления в промышленности с непрерывными технологическими процессами производит всю электронную начинку измерительных приборов самостоятельно на трех линия поверхностного монтажа с применением решений ASM. В статье рассказывается, каким образом тесное сотрудничество между обеими компаниями помогло оптимизировать весь процесс за счет улучшения движения материалов.